The building at 115 North Santa Cruz Avenue in Los Gatos, California is said-to-be haunted. Los Gatos is a small town on the 40-mile drive from San Jose to Santa Cruz, California. The population is around thirty thousand persons according to Wikipedia. The main street that runs through its downtown is named Santa Cruz Avenue. At one time with a string of mansions, now only one yet remains. It is located at 115 North Santa Cruz Avenue and is in the Queen Anne style. The house was first built in 1891 by J.J. Hill for Mary G Coggeshall, a wealthy widow with two children. In 1917 the Place Funeral Home relocated to the house. Place Funeral Home, was founded by Alexander F Place, but moved in 1917 into the building and was then operated first by E E Place and then by his son George Place, from then to 1971, when they either moved or closed. Link to a flyer from 1949 when the house was the Place Funeral Home. In 1977 the house became the Chart House Restaurant in Los Gatos, part of a chain of seafood and steak restaurants. 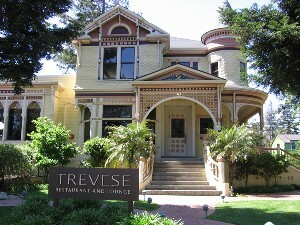 When the Chart House closed about 2007, the house was briefly another restaurant called "Chart's", and then yet another, becoming the Trevese Restaurant in Los Gatos. The Trevese is also now closed. From at least ten years ago, possibly longer, there have been reports of ghost sightings. The main one is a little girl. Here is a little more about the haunting. Another piece about the haunting. Another article about the haunting. One ghost apparently likes to run up a huge bar tab in the middle of the night on the cash register. Another likes to turn the bottles around. About Mary G Coggeshall, the 1880 census shows her living in San Francisco, having been born in Valparaiso, South America, but in the 1900 census, where she is found living in Sacramento County, it states that she was born in Australia. Her parents, whoever they were, were from Ireland. Her husband Benjamin S Coggeshall (b 1836/7 Rhode Island), who died between 1880 and 1900, was a manufacturer of koumiss which is fermented milk that was supposed to be good for certain health complaints including tuberculosis. There were still clinics in Russia that offered this kind of treatment as late as 1982. Mary had two known children Geneva (b 1872/3 Washington Territory) and Russell J (b 1876/7 California). However in the 1900 census, where she is already widowed, she states that she is the mother of three children, two of them still living. So some unknown child of hers had died before 1900. In 1900 where Mary appears alongwith her son Russell, she is listed as a fruit grocer, and he as a manager. In their household they have a number of people from Italy and Japan listed as farm laborers. Geneva would later marry a Mr Curtis and die 31 Aug 1956 in Alameda County. On Geneva Curtis' death certificate, we learn that her mother's maiden name was Barrie. The International Genealogical Index has this couple listed as Benjamin Shaw Coggeshall and Mary Geneva Barry. Benjamin is listed as born 10 Oct 1836 in Newport, Rhode Island the son of William Porter Coggeshall (1810-94) by his wife Mary Ann Shaw (1811-94). Benjamin and Mary are listed as marrying on 21 Aug 1871 but the place is not there given. This link gives 12 more generations back in the Coggeshall line.